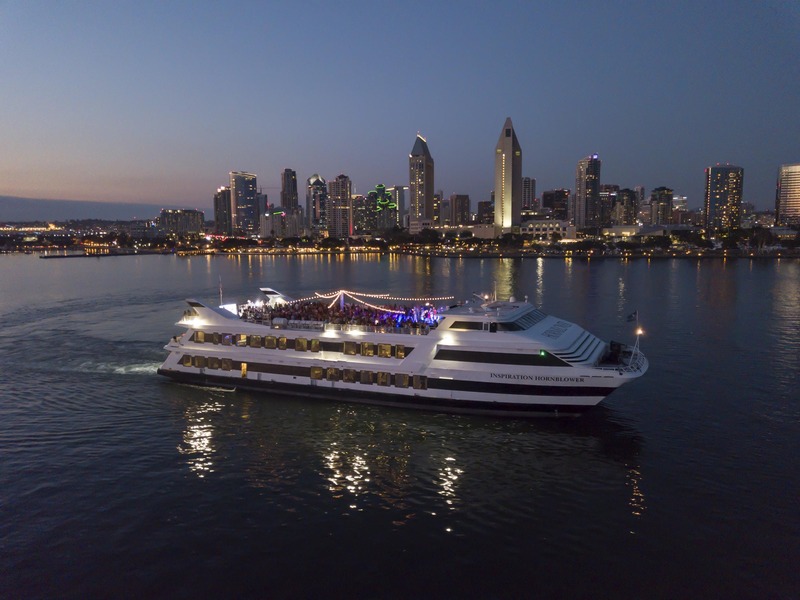 This event is a 3 Hour (7-10pm) dinner cruise on the Hornblower Inspiration. Tickets include buffet dinner, 2 glasses of wine, Artist Meet & Greet, DJ and dancing. There will also be a designated cigar area on the top deck. Shuttle service will be available from our host hotel (The Marriott Marquis San Diego Marina) starting at 5:00 pm until 6:45 pm. If you are not a hotel guest, you can park at the San Diego Convention Center and walk over to catch the shuttle. Boarding begins at 6:00 pm and the boat departs promptly at 7:00 pm. All guests will be served complimentary champagne upon boarding. Shuttle service will resume at 9:45 pm and run until 10:45 pm. There is also limited metered parking (credit card or coins) available at the boat departure site. NO REFUNDS OR EXCHANGES. YOU ASSUME ALL RISK INCIDENTAL TO THE EVENT AND YOU AGREE THAT THE PORT OF SAN DIEGO, THE MANAGEMENT, ITS AGENTS, AND THE PERFORMERS ARE NOT RESPONSIBLE OR LIABLE FOR ANY INJURIES RESULTING FROM SUCH CAUSES. NO TRANSMISSION OR AIDING IN TRANSMITTING ANY DESCRIPTION, ACCOUNT, PICTURE, OR REPRODUCTION OF THE EVENT, GAME, PERFORMANCE, OR EXHIBITION IS ALLOWED. YOU HEREBY CONSENT TO THE REASONABLE SEARCH FOR ALCOHOLIC BEVERAGES, DRUGS, OR WEAPONS. YOU FURTHER CONSENT TO THE USE OF YOUR IMAGE OR LIKENESS INCIDENTAL TO ANY DISPLAY, TRANSMISSION, OR REPRODUCTION OF THE EVENT. MANAGEMENT RESERVES THE RIGHT TO REFUSE ADMISSION OR EJECT ANY PERSON WHOSE CONDUCT IS DEEMED BY MANAGEMENT TO BE DISORDERLY OR WHO FAILS TO COMPLY WITH THE TERMS AND CONDITIONS HEREIN. All acts advertised have confirmed their appearance; however, all acts and times are subject to change without prior notice. ALL SALES ARE FINAL. NO REFUNDS OR EXCHANGES WILL BE ALLOWED. No refunds for any Artist Cancellation or Replacement. Lost tickets WILL NOT be replaced. RAIN OR SHINE.